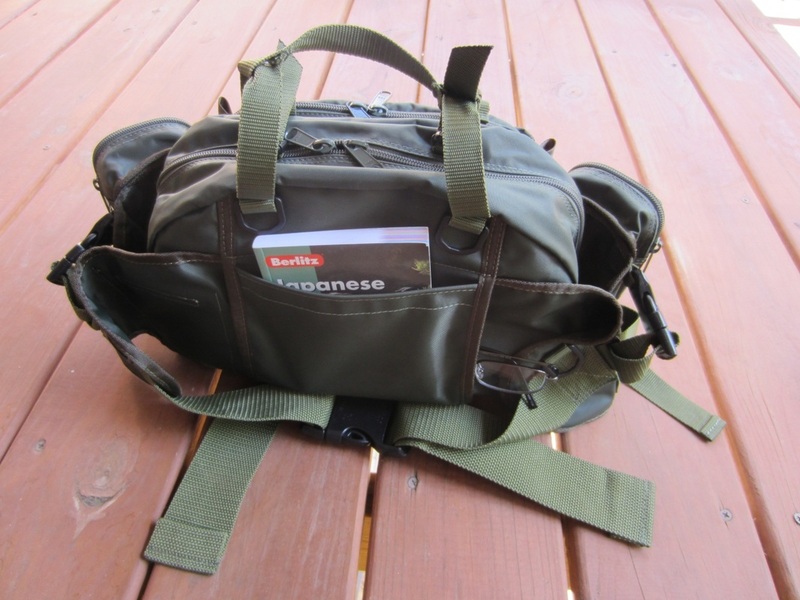 The Perrine Pack has 19 compartments for carrying a host of essentials. The main compartment is large enough for a 35mm SLR camera body plus a lens or two. 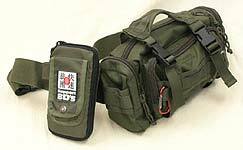 Can be worn with the belt as a traditional body pack, or it can be carried either by the built-in handle or an attachable shoulder strap. I've been using mine almost daily since 2012, and it still looks brand new. Here it is... the Perrine Pack! But it will carry more. A LOT more! 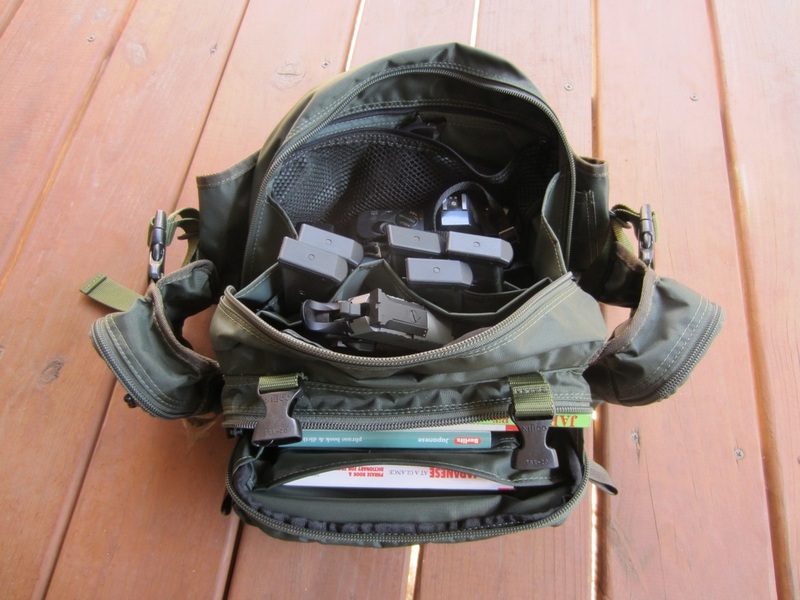 Whether you want to shoot the breeze, shoot pictures, or shoot targets, the Perrine Pack is ready when you are. It's one thing to throw a bunch of stuff in an open bag for a picture. But will the Perrine Pack actually hold all of this? 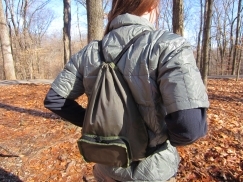 From the back, you can see yet another pocket, along with a side pouch, open on both sides. 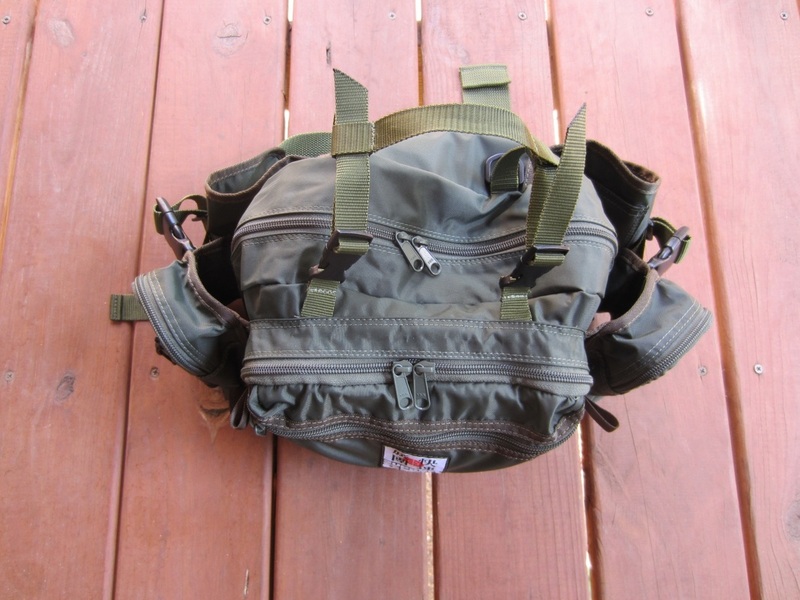 Note the hefty waist strap, for wearing the Perrine Pack. In the bottom is a secret compartment that holds the waterproof cover! 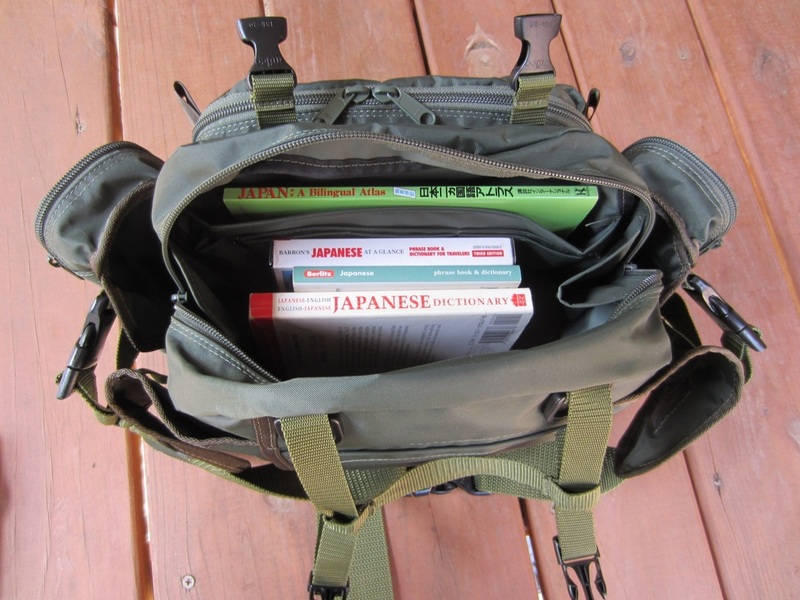 It has been very handy lately as a book-bag for my Japanese class. There it is, zipped up and ready to go! And I haven't even filled the other pockets. 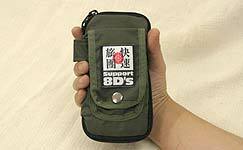 The side pockets are great for phones, iGadgets, etc. 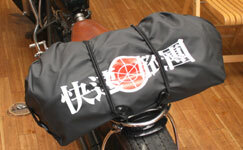 Note the handle at the top, which is the second option for carrying the Perrine Pack. 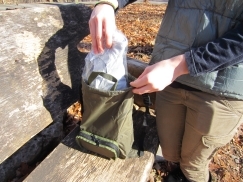 While the Perrine Pack itself is quite water resistant, if you were to get caught in a real storm, the cover swallows the bag quickly. Main compartment: One very large cavity (approx. 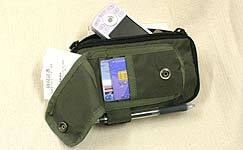 1 liter), one zippered pocket with mesh netting, one large open pocket, two medium pockets, three small pockets. Front compartment: One large cavity. 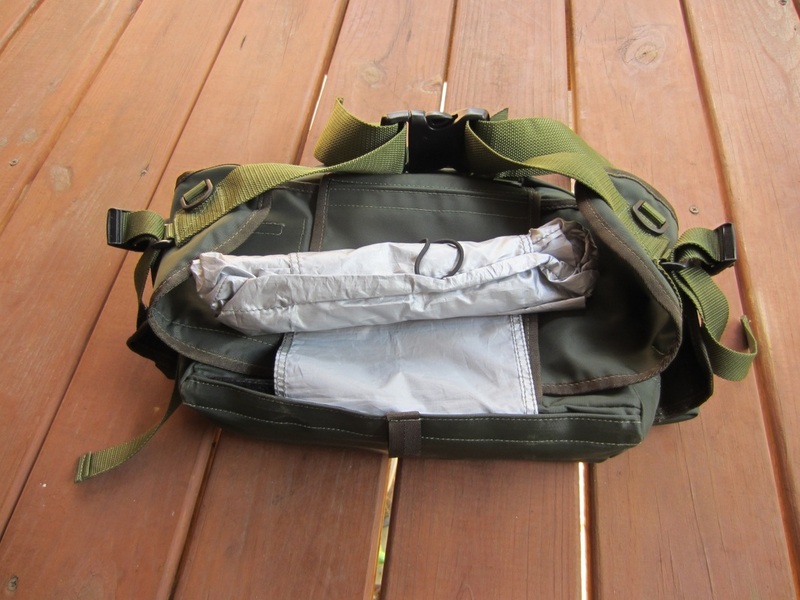 Rear: Open pocket, open-sided pouch. 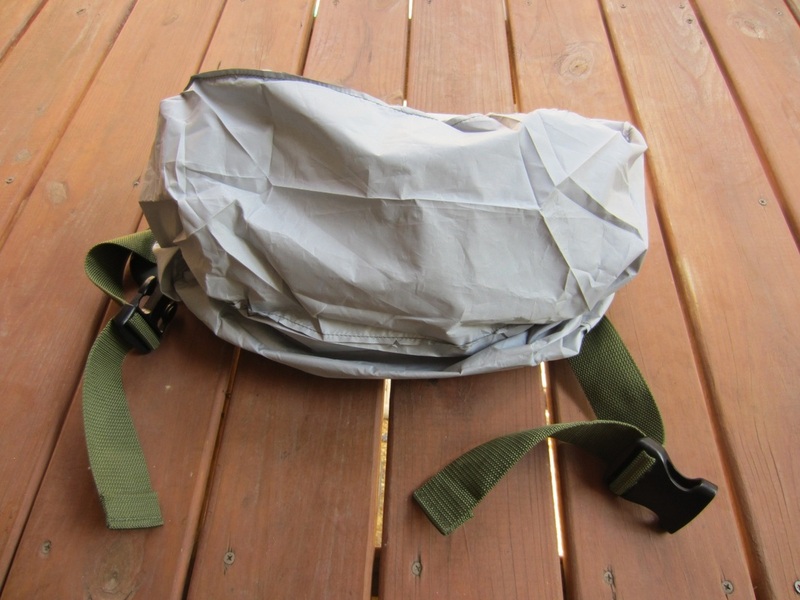 Sides, each: Medium zippered pocket with outer straps for three items. Warranty: 30-day money back satisfaction guarantee, 5-year warranty on materials and craftsmanship. For the urban adventurer, there is the Max-Pax. Designed to carry any smartphone on the market, as well as provide quick and easy access to credit/debit/identification cards, and a handy loop for a pen. Clips on to any sturdy belt, or the belt of the new Perrine Pack. 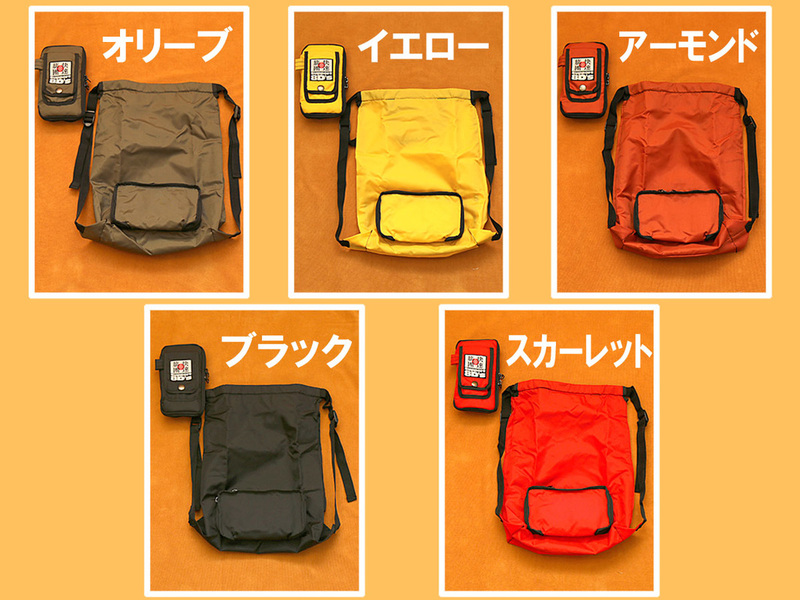 Due to customer request, we are now offering the Max-Pax in more colors! For Spring 2014, we added Kiyomi Yellow and Mihoko Almond. In Spring 2016, we added Scarlet Red and Tuxedo Black. New colors for 2016 - red and black! 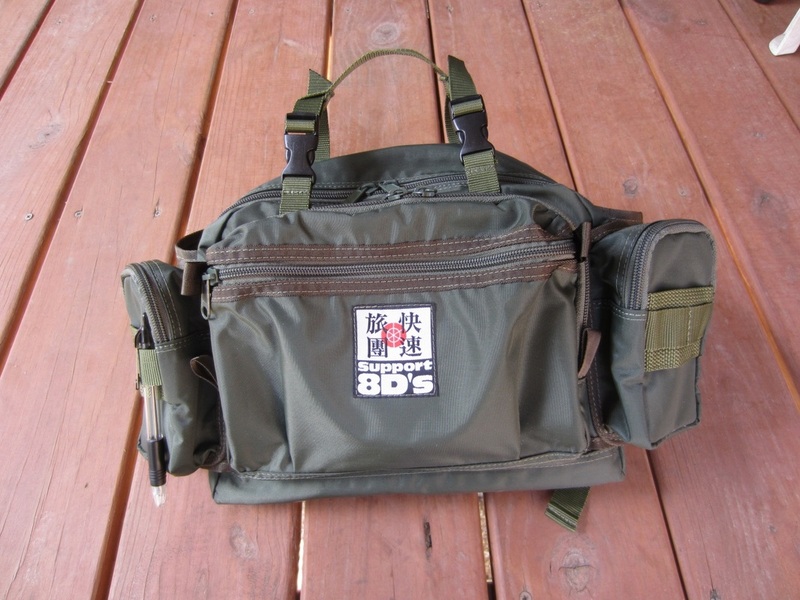 Attaches securely to your belt or the Perrine Pack. Look good AND be practical! Best of all, it opens into a handy backpack/handbag! How does it do that? 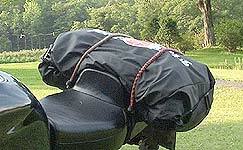 Check out the video below of the model as she demonstrates the Max-Pax. 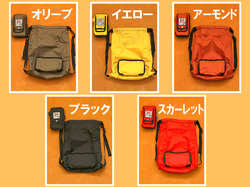 I use the Max-Pax in my travels all over Japan and I use it daily back here in the U.S. I'll leave the house using it as an external wallet, holding my phone plus a stock of business cards. 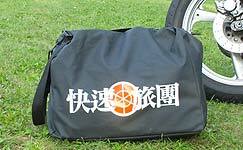 I'll return home using it as a backpack, full of groceries or items picked up while running errands. The Max-Pax is with me every single day. It's a brilliant little thing, I love it! 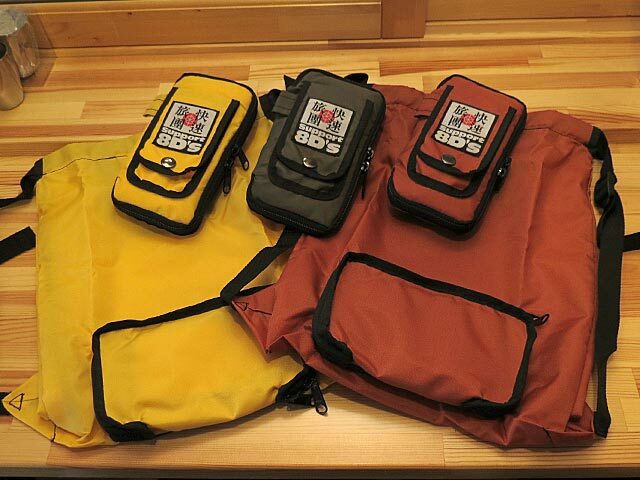 A tough, waterproof, ready-to-tumble carry bag that can swallow enough provisions for a long road trip. 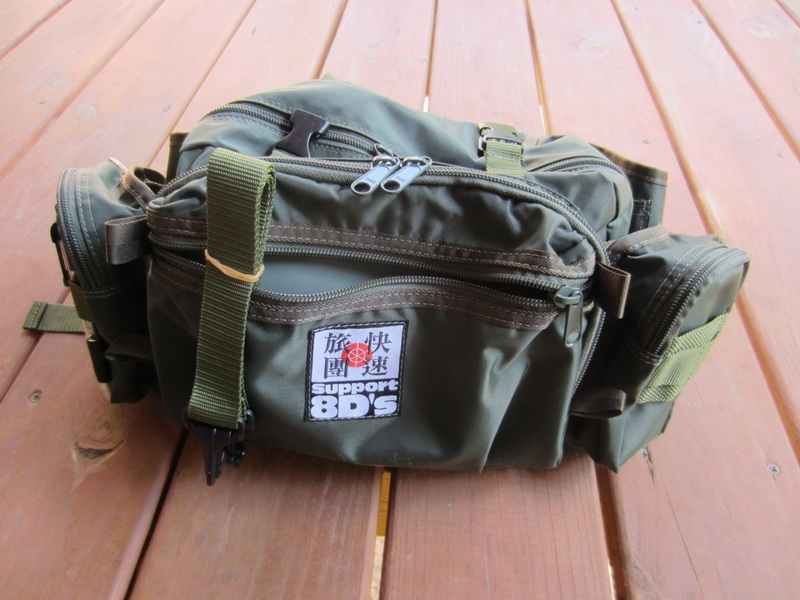 Handy shoulder strap for when you're off the bike (or out of the car/RV/etc.). Or add ice and use it as a beer bag! Zippered opening runs all the way across for versatility and ease of access. A hit at the 2012 Trail Days, the SPaC (Small Packing Comfort) Mat is a multipurpose nylon-weave tarp that weighs only 96 grams (that's 0.21 pounds for us Americans) and unfolds to approximately 3' by 3'. 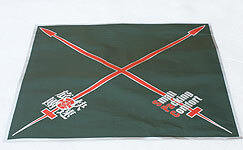 If you need a dry place to sit or change clothes, a dry place to lay your stuff, something light and strong to wrap your things up, or even a windbreak, this mat is invaluable and takes up very little space in your pack. You will always be coming up with new uses for the SPaC mat!